First a warning: This recipe is not cheaper than buying a box of cheese crackers at the store. If you are looking to save a dime or two, then just skip the recipe... especially with coupons. But, this recipe is healthier. A lot healthier. And ridiculously easy to make. For some reason, I was really reluctant to make these. I've been looking at cheese cracker recipes for quite some time. I just could never bring myself to commit to making them. 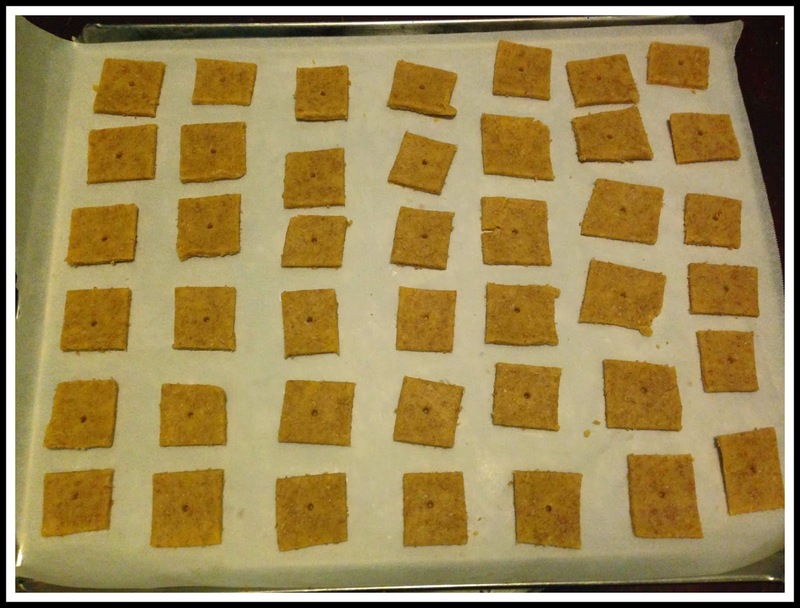 I had it in my head that homemade crackers were time consuming. After a really bad day, I needed to do something productive besides cleaning and working in the garden. I needed to do something nice for everyone I snapped at. Homemade snacks always seem to do the trick around here. Usually brownies, but I was still a bit frustrated... so whole wheat cheese crackers seemed a nice alternative. Nice and homemade, but also healthy. The dough mixed up quickly. I made two batches, one with cheddar and one with Swiss. Roll the dough out to 1/8 inch thickness and use a pizza cutter to trim it in to one inch squares. I used the small end of a chop stick to poke a hole in the middle...because real cheese crackers have holes. 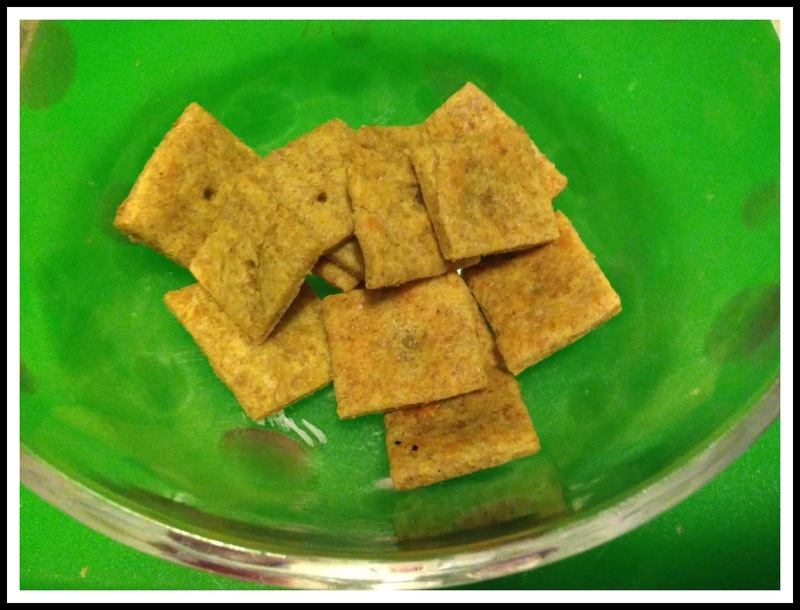 The cheese taste gets stronger once the crackers have cooled. The kids snatched them up before I got a good picture of the first batch. Mix the first four ingredients together with your fingers until it resembles crumbles. Sort of like you mix a pie crust. Add in the cold water and continue mixing until the dough comes together. On a lightly floured surface, roll dough out to 1/8 in thickness. Cut into squares using a pizza cutter. Place squares on to parchment paper lined cookie sheet. Bake for 15-17 minutes. Cool completely. These look really good. I love crackers, and now that I'm getting older I am always looking for more healthly snakes. Pinning to try later! Thanks for sharing! Stopping by from yumeating.com (non blogger blog) and the WLOW link up. I love making my own crackers and breads. That way I know they don't have a lot of extra chemicals in them. 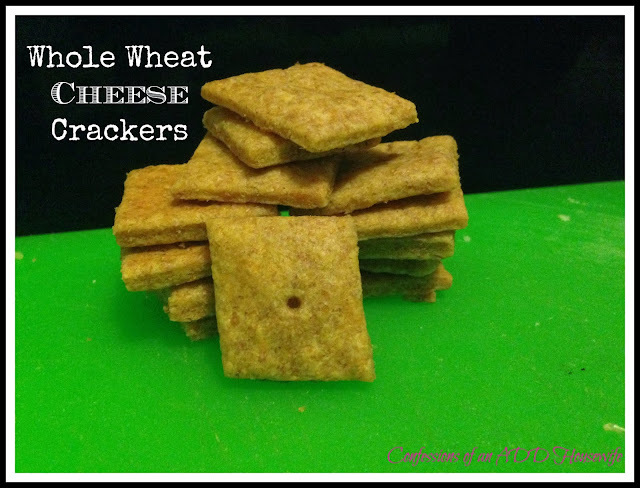 I have been looking for a wheat cheeze it type recipe that isn't full of almond flour or flax. Thank you for sharing this one. Going to have to give it a try this weekend as it looks really easy and good. What a great idea! My son loves cheese crackers (but I don't always love whats in them). Pinning for later- pretty sure I have all the ingredients on hand. Might whip up a batch tomorrow!